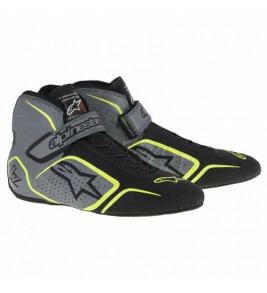 Alpinestars Tech 1-Z race boots. Incorporating advanced performance technologies and premium materials such as supple kangaroo leather, the extremely lightweight Tech 1-Z features streamlined foot-shaping, extensive perforation zones and Alpinestars exclusive rubber compound sole for superb levels of comfort and maneuverability in the confines of the cockpit. The collar padding is constructed from Nitrile rubber for comfort and weight-saving, whilst the tongue padding is made in a double layer of CarbonX® material for additional flame-retardant properties, plus reduced weight.